I found this recipe on Skinnytaste and couldn’t wait to make it. I never make Caesar salads because they are so unhealthy but this recipe gives you all the Caesar salad flavor but without any of the guilt. I adapted the recipe a bit by adding some Worcestershire sauce, black pepper, and extra garlic. 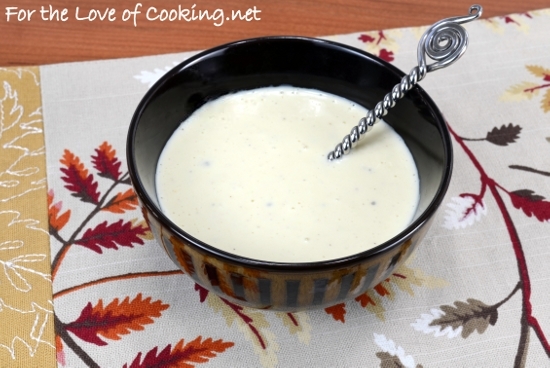 This creamy dressing has a ton of flavor and it was super simple to make. I loved how tangy and garlicky it was. This will be a regular on my table from now on. Combine the cheese, lemon juice, minced garlic, Dijon mustard, Worcestershire sauce, freshly cracked black pepper, to taste, and anchovies in a small bowl. Mix with an immersion blender until well combined. Add the oil and Greek yogurt and mix with the immersion blender until creamy and smooth. Taste and re-season with freshly cracked pepper, if needed. Enjoy. I like a good caesar dressing, but I’ve steered clear of making them as well. The anchovies always weird me out! I’m tempted to finally try one at last, now that you’ve given this one your stamp of approval. It sounds good. I make mine the same way but without the lemon juice, Worcestershire Sauce, and yogurt. Will have to add these I am sure the dressing will become more delicious!! Pam, This sounds really delicious!!!! Sounds like a nice alternative to my favorite salad dressing and I’ll give it a try first chance I have. This sounds like a great healthier dressing with a ton of flavor. I like your addition of extra Worcestershire and garlic. 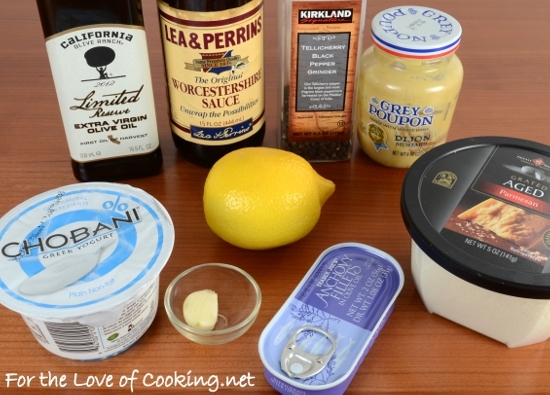 I’ve made a dressing similar to this but it doesn’t use anchovies… just the Worcestershire… Oh and I used that really bad for you mayo! lol I will have to try this next time I make a Caesar salad… sounds perfect! I love Caesar salad, but like yourself, I don’t like the fat and calories it contains. I’ve tried so many home made Caesar dressings and none have turned out so I normally just take Renee’s all natural light caesar dressing and dilute it with water or yogurt. 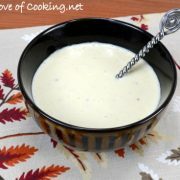 This dressing recipe looks great and I love that it isn’t loaded with oil like most dressings. I’m going to try it without the anchovies. Caesar is one of my favorite dressings. Love that you used Greek yogurt in this too! Your dressing looks easy and delicious Pam. 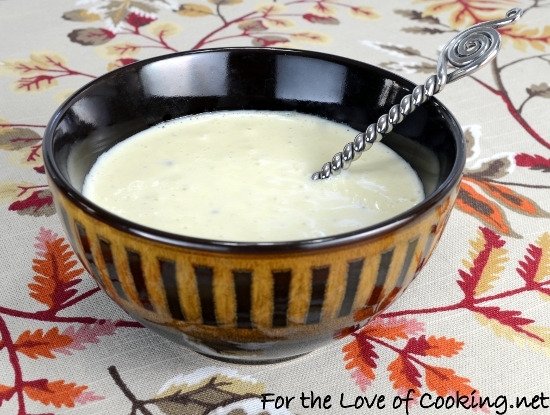 I have a son that just loves Caesar dressing so I’ll pass your recipe on to him too. We need new salad dressings with Spring just around the corner! Skinny caesar!? Love it! I haven’t had a a caesar salad in ages because they are so caloric at restaurants…but this is the perfect make-at-home version. Wow, and its made with yogurt. What a tasty idea. Anchovies, yogurt, parmesan, lemon, garlic…these are a few of my favorite things, and all in one recipe! I don’t have many recipes for dressing, but this is definitely one I am keeping. Can’t wait to try it! i am so over buying dressings, homemade really is where it’s at. can’t wait to try this! Whoa…can’t wait to try it!! I’ve always loved Caesar dressing, but never seem to make it at home because it’s rather time consuming – this is definitely one of the easiest adaptations I’ve seen! Very creamy! And if you don’t mind, Pam, I want more anchovy filets. yum, glad you used the anchovy fillets, that makes a caeser dressing! I prefer using anchovy paste in mine, that way I don’t have to see the fish, lol. I have been using Greek yogurt a TON. For almost anything that calls for sour cream, I’m using yogurt. Love the taste and don’t miss the calories.